Download "How to Locate and Stop Costly Water Leaks"
3 100 increments around the outer edge. Record the location of the sweep hand. Wait 15 minutes and check the sweep hand again. A small leak may take several minutes for the sweep hand to noticeably move. If the sweep hand has not moved, there probably is not a leak. Newer meters are equipped with leak detectors. This is a red triangle on the register face that will rotate when water is passing through the meter. Movement of the leak detector is more noticeable than the sweep hand when small amounts of water pass through the meter. If either the sweep-hand or leak-detector dials are moving, with no apparent usage of water in the house, you may have a leak. Determine if the leak is in the home or underground Locate the master valve. The master valve is usually located under the house in the crawl space or in a basement or utility room. Closing the master valve shuts off the water entering the house. 5 the tank to the bowl. When this happens, the commode tank may refill and stop periodically. 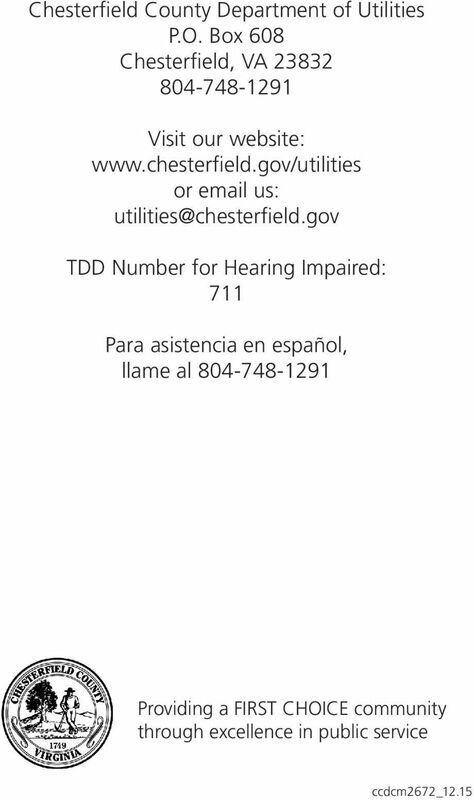 If this is occurring, contact Chesterfield County Utilities customer service at for a dye tablet, or put a small amount of food coloring into the tank. Do not flush the toilet. If the water in the bowl changes color after a few minutes, there is probably a leak in the toilet. Check the plunger ball, or the area around it, and the flapper valve at the bottom of the tank. Hardware stores usually carry repair parts for toilets. 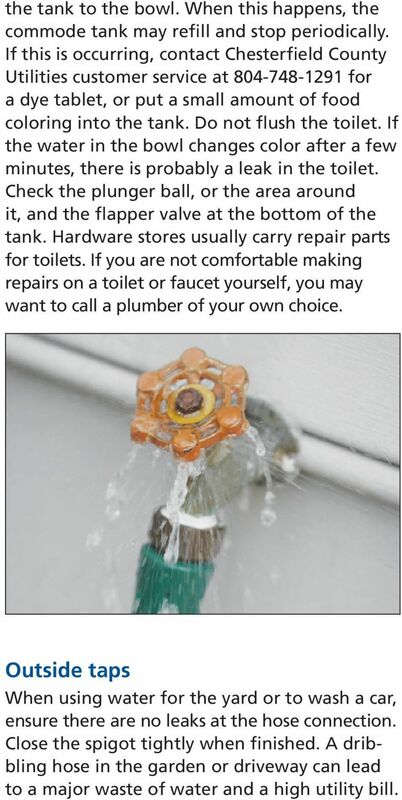 If you are not comfortable making repairs on a toilet or faucet yourself, you may want to call a plumber of your own choice. Outside taps When using water for the yard or to wash a car, ensure there are no leaks at the hose connection. Close the spigot tightly when finished. A dribbling hose in the garden or driveway can lead to a major waste of water and a high utility bill. Water Meter Basics leak detection and water consumption calculations Calculating Water Use Have you ever received your water bill and thought to yourself, How could I have used that much water in two months? Kimberley Driscoll Mayor CITY OF SALEM SALEM, MASSACHUSETTS ENGINEERING DEPARTMENT 120 WASHINGTON STREET, 4 TH FLOOR SALEM, MA 01970 Phone: (978) 745-619-5673 Fax: (978) 745-0349 DAVID H. KNOWLTON, P.E. Water is precious. Let s conserve it at work. Leakage from customers supply pipes code of practice South East Water This leaflet forms part of our Customer Code of Practice, which provides a guide to the services we provide for domestic customers. Plumbing Lesson One: Help! Call the Plumber Facilitator Guide Building Basics was paid for under an EL Civics grant from the U. S. Department of Education administered by the Virginia Department of Education. Frequently asked questions about Rain Water Harvesting. All comments and ratings received for this trader are collected here to help you make a decision when choosing your trusted trader. PUBLIC WORKS TECHNICAL BULLETIN 420-46-2 30 SEPTEMBER 1993 PROCEDURE TO DETECT WATER DISTRIBUTION SYSTEM LEAKS Public Works Technical Bulletins are published by the U.S. Army Center for Public Works, Ft.